Find a vacation home to rent in Hesse from our list of vacation rental properties. Campaya has over 337 vacation homes available in Hesse, which give you the possibility to locate a unique accommodation in Hesse which completes your check-list in search for the perfect self catering vacation apartments in Hesse or vacation villas in Hesse. This comfortable and spacious holiday apartment has three separate bedrooms and bathrooms. Each bedroom has a separate terrace. This serene and pleasantly furnished apartment is a holiday home on the ground floor and basement. You can relax enjoy hiking or cycling in this region. Machtlos 7 km from Ronshausen: Cosy resort "Ferienpark Ronshausen", surrounded by trees and fields. Outside the resort, in a quiet position on a slope. For shared use: indoor pool (14 x 5 m, extra). Your house is located in a well-kept holiday home park in the North-Hessian highland. Each house is surrounded by their own lawns, the homes practical. 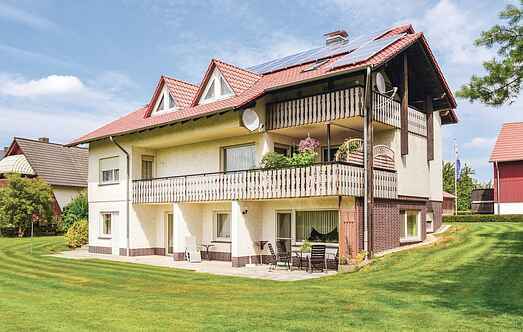 This holiday apartment is in a nicely landscaped holiday resort in North-Hessen Mountains. These holiday homes are surrounded by lawns and are modern and comfortably furnished.